The Common Denominator NBA and NCAA title runs, Phoenix and Milwaukee, San Diego and Boston, Twitter fights and Hollywood movies, ESPN and TMZ: What do all these things have in common? Jared Dudley. ared Dudley, BC ’07, keeps walking onto courts he’s not supposed to. Despite Kanter’s criticism, Dudley will be back for a 12th year in the NBA, where the average playing career is only around four. At 33, Dudley still has a baby face, which he consistently frames with a sweatband. His body is best described by absence—absence of Blake Griffin’s biceps and LeBron James’ pecs; his calves aren’t like Ray Allen or Dwight Howard’s; and I can’t comment on his abs. But the journeyman has managed to stay alive in many different NBAs, beating his quicker, stronger, jacked-er opponents by sheer force of will and flexing of his on-court IQ. udley is one of the few NBA players that BC has produced who has league stamina and prominence. The story of how he got there is unlikely. Though he led Horizon Christian Academy to two state championships, Dudley didn’t have any appealing college offers on the table by the time his senior season ended. So, he decided he would go to prep school after graduation, and played another season of summer ball, excelling and winning tournaments with the likes of Nick Young and Jordan Farmer. Then, he got a call from Boston College. The Eagles were wondering how the forward’s recruiting process was going and, as it was panning out less glamorously than desired, suggested Dudley come up for a visit. Without thinking he would ever go to BC, Dudley agreed to see Boston’s College anyway. His room was almost fully packed for prep school, but he put some clothes aside for a short stay. BC’s men’s basketball team had taken a few hits that summer—from players losing their eligibility to catching homesickness. In need of an unexpected savior, the coaching staff showed Dudley what BC had to offer him (including an imminent move from the Big East to the ACC). They offered him a spot on the spot. Dudley went home, and when he told his mom what had happened, she reasoned with him. 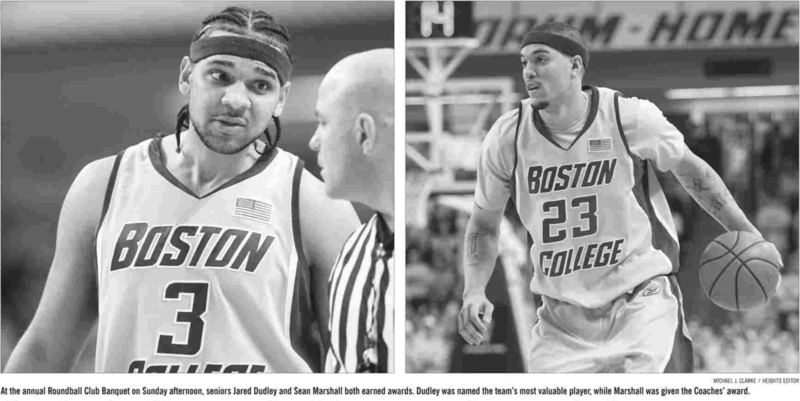 “My mom says ‘Hey Jared, if basketball doesn’t work out for you, you’ll always get a job because Boston College is a very prestigious academic school,’” Dudley said. Dudley walked into Conte to 24 skeptical eyes. He says he signed Aug. 27 and was in school Sept. 4. Dudley—cognizant of his lack of speed, his appearance, and the fact that he had a lot to prove, being the unknown guy on the tight-knit BC team of superstars like Craig Smith, Louis Hinnant, Sean Marshall, and Sean Williams—put his head down. “We get on the court, and he’s just outworking everybody,” Hinnant said. There Dudley was in maroon and gold, picking off sloppy passes, and stealing rebounds away from big men in the paint. He did the dirty work of the game, always boxing out and pushing players around. “A lot of times you get to these high-level schools and talent trumps everything, and guys are jumping out the gym and they have these bodies that are God-given,” Hinnant said. Jared is the personification of the proverbial encouragement of youth coaches everywhere: “Hard work beats talent when talent doesn’t work hard.” Hinnant says that Dudley epitomized the “grit ’n’ grind” mentality, and the attitude spread through the team like mono in a freshman dorm—everybody had it, and everybody’s mindset changed because of it. “Everything’s been earned with Jared, not given,” said Director of Athletics Martin Jarmond. The Eagles, who Dudley describes as “blue collar,” made their mantra “No one’s going to pick on us, we’re going to do the picking on.” He explains that BC was always the underdog, so it targeted underdogs in its recruiting. Everyone on the roster carried a chip on their shoulder—with nothing to lose, and everything to prove. “We weren’t going there to be in the conference, we were going to win the conference. 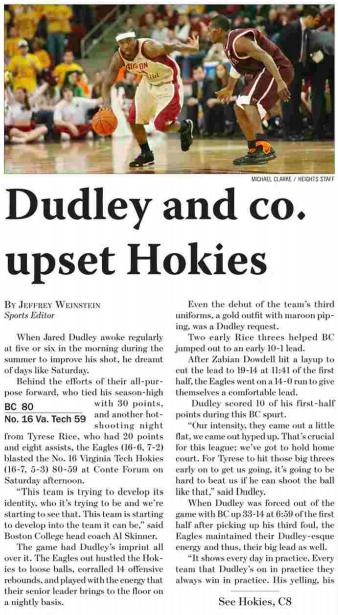 … We took the ACC by storm,” Dudley said. Dudley quickly emerged as a leader on the team, and he and Hinnant became close friends. They were two of the guys who spent night after night in the locker room, sometimes for the love of basketball, and other times to stay up all night and play Madden. People around Dudley describe him as a goofy, outgoing guy, who’s always cracking jokes and having fun. This changes as soon as Dudley enters into game mode. 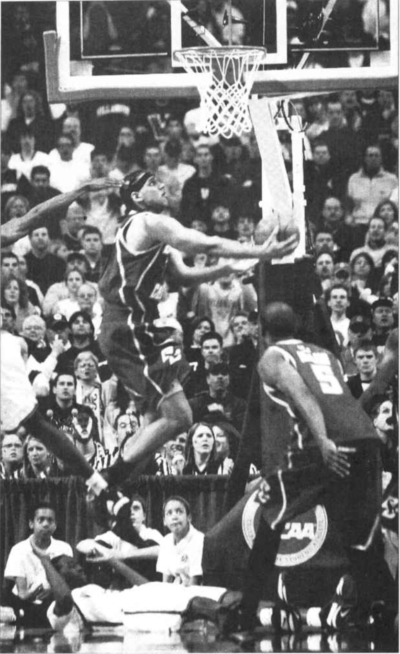 His career-high scoring game was against rival Villanova in 2005. Dudley racked up 36 points. The crowd that day was energetic, with all the seats in Conte occupied—and despite accidentally oversleeping, the forward got in a groove early in the game. Dudley’s relationship with the rowdy college crowd surrounding him was symbiotic. He had already thrown his headband into the sea of fans, and the more sweat dripped from his brow, the louder the crowd got—the more loose balls he dove for, the more security’s control of the arena dwindled. BC basketball games, at the time, were a tug of war game between Dudley and the crowd—the more he pushed himself, the more it grabbed back. The more electric the stands became, the more essential basketball became to the BC community. Midway through his college career, Dudley, having already shown he could play at a high level, embarked on a mission to expand his skills and refine his game. “Jared being Jared, he put his mind to it and his body to it,” Hinnant said. Dudley did something crazy—he went from being an average shooter to being an absolutely elite shooter—raising both his field goal and 3-point percentage by 10 percentage points, and leading the ACC in shooting percentage in the 2006-07 season. Ed Cooley, assistant coach under Al Skinner, explained that Dudley was always forward thinking and talking about “the bigger picture,” and that if you leave a conversation with Dudley, you walk away feeling better than you did before. The first year BC played in the ACC (2005), it went to the conference championship game, and only got beat by a rogue Duke fade-away 3-pointer. “It was J.J. Reddick–I can still see the shot,” DeFilippo said. The run, his success, and his love for the BC family have been on Dudley’s mind since. When he thinks of BC, he thinks of Doug Flutie, and Dudley says he hopes to become a Flutie-esque figure for the community, as he thinks he has a lot to contribute to Athletics. The Flutie phenomenon, and the way it catapulted the University, was the result of timing and, in some ways, an aligning of the stars. But Dudley has still certainly entered the pantheon of BC greats. “When you talk basketball, it’s hard to have a conversation with alums without talking about Jared Dudley,” Jarmond said. udley started playing basketball because his older brother did, and he started getting serious about basketball because he heard club teams got to travel. Traveling was something he loved to do, but his mother, being a single parent, never had enough money or time to take him to Disney World. He spent every hour of the summer and every minute of free time at the Boys and Girls Club by his house, working on his game to get to big tournaments in Orlando, Texas, and elsewhere across the nation. Now he’s played for Larry Brown and Doc Rivers—he’s played with Steve Nash, Shaquille O’Neal, Grant Hill, Giannis Antetokounmpo, Chris Paul, Blake Griffin, and John Wall. Instead of just facing challenges, Hinnant emphasizes that Dudley “bodies” them. He always seems to know what needs to be done and is one step ahead of everyone mentally. Hinnant recalls Dudley’s strategic participation as a high schooler in ABCD All Star Camp. While other elite players were fumbling around in search of points, points, and more points, Dudley got his hands on a scoring worksheet. He figured out something the basket-chasers around him failed to realize—you got bonus points for obtaining a certain number of combined points, assists, and rebounds per quarter. Dudley patterned his game around the worksheet for the whole camp—while other players jacked up shots into oblivion, he was getting bonus points for assisting and rebounding his way to the top. As Hinnant says, he succeeds by knowing his game plan. Hinnant, Defillipo, and Cooley all attribute his model of sustained success to a high IQ and strategic mind. Dudley was drafted 22nd by the Charlotte Bobcats in 2007—a class including Kevin Durant, Al Horford, and Greg Oden. He says he remembers crying for all the hard work he put in, and for hearing his name said in then-NBA Commissioner David Stern’s voice. The next day he flew to North Carolina. Dudley started his first career game against the Boston Celtics and was welcomed to the NBA with the task of guarding Kevin Garnett. Always the man with the plan, Dudley used to make lists to show his mom of star forwards whose height and weight he needed to emulate to make it big—Garnett had joined Pippen at the top of his childhood rankings. Dudley was then added to a stacked Phoenix Suns roster in 2008—his name now on the same page as Steve Nash, Shaquille O’Neal, Amar’e Stoudemire, and Grant Hill, and his shooting became a key component of the Suns’ 2010 playoff run. The excitement of basketball in late May electrified the cities of Phoenix and Los Angeles. The Western Conference Finals matchup made its way to a Game Five, shocking fans on both sides: The series was tied, 2-2, and the game was tied 101-101. Kobe Bryant had the ball—a phrase which could make anyone’s knees shake, and ankles start to break. Number 24 was about to become a five-time NBA champion, and two-time finals MVP, but with the clock winding down, he jacked up an air ball. The Suns were stunned, never expecting a Kobe shot to not touch the rim—Ron Artest (now Metta World Peace) was the only one who anticipated it. He caught the run away basketball and drove it home to give the Lakers the win. Though it was a year that didn’t end in a ring, Dudley calls it the most fun, given the group of guys he was surrounded by. After a stint in Los Angeles with the Clippers, he shipped up to Milwaukee. Instead of baking in the Phoenix heat with champions and future Hall of Famers, he was frozen with a young team that was coming off a 15-67 season—the worst record in the NBA during the 2013-14 season. Dudley was one of three veterans on the team who helped clean up the Bucks’ act the next year, when they finished at .500. The BC grad was no longer the young guy on the roster who played video games after practice–he was the old man with three kids and no excuses. That year, the Bucks became the youngest team to make the playoffs, and Dudley learned he was pretty good at playing the role of mentor to younger guys, like Steve Nash and Grant Hill had done for him. Dudley also thinks that he could be coaching the younger guys he’s played with one day, something his BC mentors echo. “I think he would be a great coach. I don’t know if he’s interested in coaching or not, but if he was … wherever he goes he’ll be successful,” DeFilippo said. Dudley has had to adapt his game from an NBA dominated by bigs and physicality to fit a league increasingly addicted to sharp-shooting on the perimeter—and he’s had to shift from playing major minutes to playing the role of mentor on the side. And he’s been good at it: At times during his career, Dudley has found himself atop some coveted league rankings. In 2011-12, for example, Dudley placed third—behind Dwyane Wade and James Harden—among shooting guards with the best shooting percentage (at 45.8 percent from the field overall). “The unique thing for me is being able to adapt for two kinds of NBAs. And for someone who’s not considered fast, athletic, tall, long … that tells you something about me as a person and a player,” Dudley said. 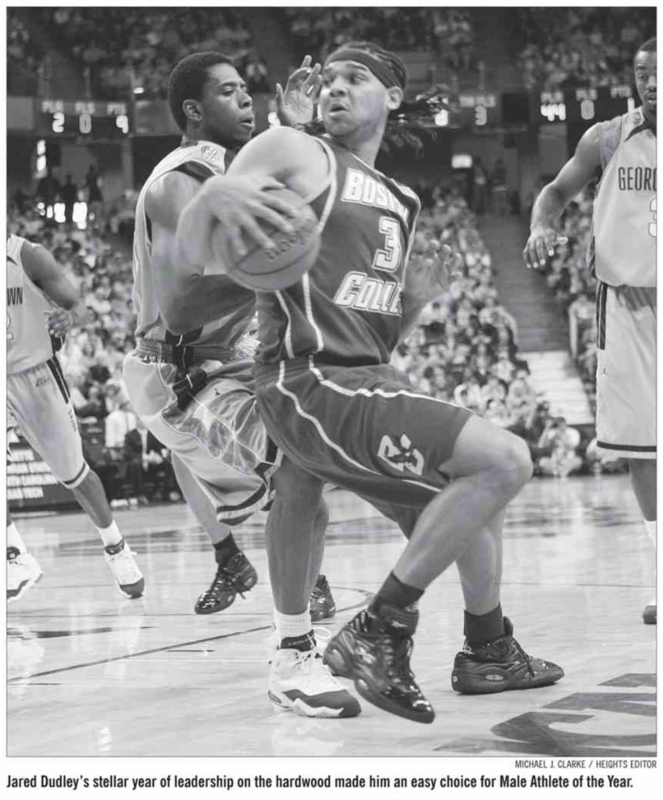 Dudley’s career has been characterized by constant movement, which is something he sees as an asset. This season, he’s with the Brooklyn Nets. In 2011, he had pondered whether Dwight Howard wanted to go there, with a tweet saying “I don’t wanna get in Dwight Howard’s business but lol Why would you wanna play for the Nets over teams such as the Lakers,Bulls, and Mavs.” Howard eventually chose to go to the Houston Rockets. Dudley, who calls himself “half-media, half-player,” has since explained that he didn’t mean disrespect to the Nets organization, but was merely asking a question in pursuit of listening to the opinions of others. He even offered tickets to a fan who tweeted that Dudley was not welcome to Brooklyn—an interaction that is not out of the blue for Dudley, who constantly replies to anyone who engages with him on social media. In this way, relationships are at the core of everything Dudley does. Cooley says he has a knack with people. He respects everyone he works with, leaving a lasting impression—and as Hinnant says, if you bad mouth Dudley to anyone, there’s going to be a lot of people coming after you. “He has what I call the ‘ultimate it,’ and none of us can explain it—you either have it or you don’t. Jared has the ‘super it,’” Cooley said. During his third season in the NBA, Dudley saw Shaq tweet at halftime in the locker room. In the next few minutes, Dudley became part of a minority of people in the world who have had Twitter explained to them by the four-time NBA champion/rapper. Dudley quickly learned the art of the # and craft of the @. Now, Dudley sees Twitter as an important tool in connecting with media members, coaches, general managers, and other people in his field. “If there’s one thing about me, I definitely stay connected to the right people, talking to them, learning about the business,” Dudley said. He also uses it to stay “relevant for those young people,” especially at BC, so that they remember him if he ever wants to return to campus—which he says he can see himself doing in either a coaching or ambassador role. “Even though it’s not a job, it’s a resume,” Dudley said about Twitter. Dudley is vocal in the huddle, vocal on Twitter, and vocal during interviews and media days—those are the areas of access to Dudley’s thoughts. He’s constantly tweeting and speaking his mind—on matters ranging from the league to health insurance rights—being no stranger to the backlash that can come with being outspoken. He’s assessed Kobe Bryant and Carmelo Anthony, calling them both overrated, and remarked that toward the end of his career, Kobe, a waning star, couldn’t find anyone to play with him. Though people came after him on Twitter and abroad, he stuck to his guns and was ready to defend his point. “To be honest with you, ESPN loved it. ‘Hey, Jared has a strong opinion. We like him.’ They wanted me back the next year. Blowing my phone up and saying ‘hey he’s not afraid to speak his opinion,’” Dudley said. Zola says that Dudley is doing exactly what all athletes should be doing. He’s had a “wildly successful playing career in the NBA,” but inevitably, that career ends as your ligaments become less elastic and knees stop wanting to take the abuse of the hardwood. And so Dudley has used the visibility of his platform to build his brand, ensuring that he’s well set up for whatever he wants to do next (even if it’s another movie—after making a cameo in Movie 43, Dudley is open to the possibility saying “I heard LeBron’s doing Space Jam 2. If I play for the Lakers next year, I need to get in that”). With laser focus, he’s using basketball as a means to an end, whether that end be becoming an analyst, a general manager, or a coach. If he decides to become an analyst, he’ll become part of a rich tradition of BC alumni covering sports on television, including Flutie, Joe Tessitore (of Monday Night Football), Matt and Tim Hasselbeck, Bob Ryan, Mike Lupica, and Mark Herzlich. “Whether it’s an interview, whether it’s a podcast, whether it’s on Twitter—he has an opinion. He’s not vanilla. He takes a stand and he calls it like he sees it,” Zola said. He’s known as the guy who’s more than willing to talk, and that, paired with his extensive knowledge and experience of the league, he hopes will help bolster and facilitate a new successful post-playing career—one DeFilippo says will be successful no matter what he does given his intellect and personality. udley has big aspirations, but he hasn’t forgotten his roots while playing among the stars. He still makes his way to the Heights, whether it be for a football match-up against Notre Dame, or to bum rush the floor when basketball beat Duke. And sometimes the Heights makes its way to him, as Jarmond met him for dinner earlier this month in New York. “There is no basketball player for sure that has been connected to the sport of BC than I have,” Dudley said. “He probably wouldn’t want me to say this, but he’s a donor, and he gives back … When I first got here, I said ‘Jared, I need you to be the guy or one of those guys in basketball that other people can say ‘hey you should give and support and give back to this program because Jared Dudley did that.’ He said ‘absolutely Martin, whatever you need me to do,’ and he’s put his money where his mouth is too. I would say that his impact and his legacy, obviously he’s continuing to build that, and I think there are even greater things for Jared Dudley in his future when he stops playing basketball,” Jarmond said. Those roots definitely haven’t forgotten Dudley, either. His tenure—with its playoff runs, and postseason success—represents the gold standard for BC basketball. “In my opinion, Jared’s era made basketball relevant at Boston College,” Cooley said. 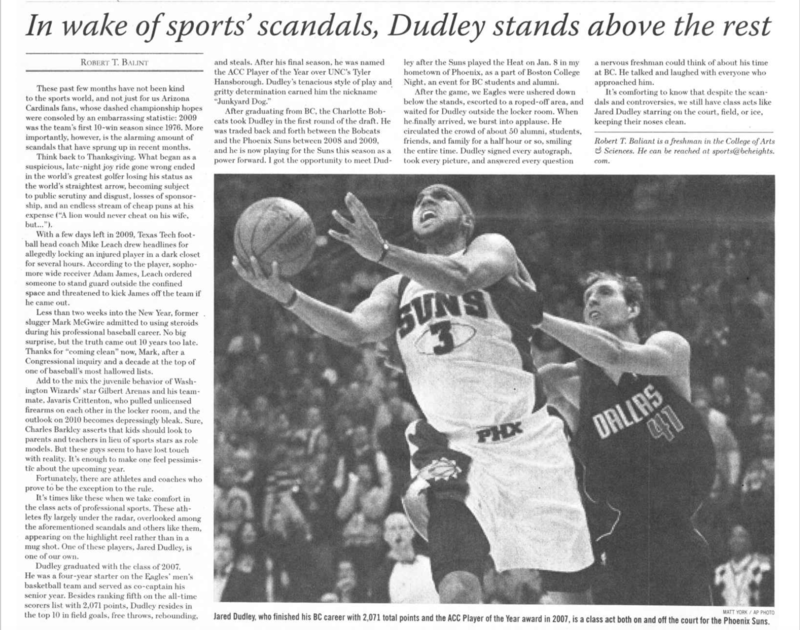 Correction: This article originally said Jared Dudley is in the BC Athletics Hall of Fame. He is in the BC Interruption Hall of Fame (Class of 2018).